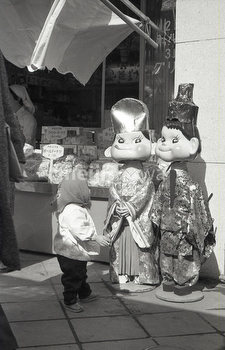 A little Japanese girl looks up at life-sized dolls of Peko-chan and Poko-chan in traditional Japanese kimono at a Fujiya confectionary store, 1960 (Showa 35). Fujiya’s pig-tailed Peko-chan mascot first appeared in 1950 (Showa 25) to promote the company’s Milky candy. Her boyfriend Poko-chan was created a year later.